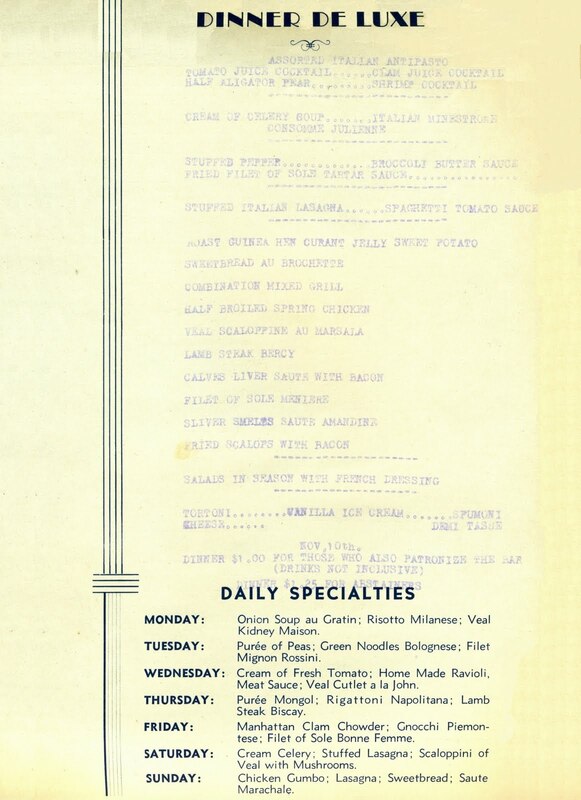 The American Menu: Italian. Well, sort of. I recently walked over to 139 West 10th Street in order to see where the Italian restaurant in John Sloan’s 1912 painting Renganeschi’s Saturday Night had once been located. Sloan lived only two blocks away and is known to have eaten there. On at least one occasion, he was even joined by Robert Henri, a fellow artist of the Ashcan School of realist painters. The artists and writers in Greenwich Village were fascinated by their neighbors, often using the social life of the city as the subject of their art.1 In this painting, Sloan depicts three young women sitting around a table on a girls’ night out; the scene looks so familiar that updating the clothing style would bring it into the present day. In fact, it was fascinating to see that there was still a restaurant in the old building, and that things had not changed as much as I might have expected. When Renganeschi opened in 1898, foreign restaurants had been gaining in popularity for more than two decades. 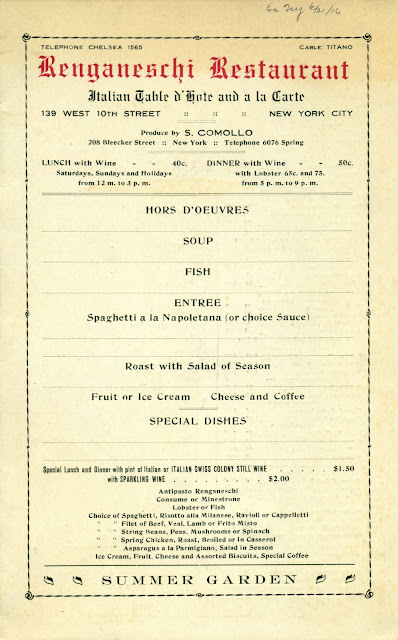 Although the dishes on the menu below from 1916 appear to be authentic, there were already reports that it was becoming difficult to find real Italian food in New York, for the cuisine in such restaurants had been evolving for some time. 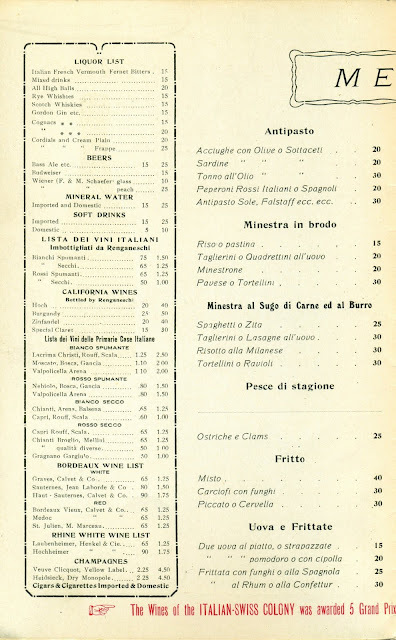 Historian Andrew Haley recounts in Turning the Tables that standard English-American fare began to appear on the menus of Italian restaurants, German beer halls, and Chinese chop suey houses in an attempt to attract more customers from the middle-class.2 Renganeschi’s set menu on the front cover offers a typical selection of roasts, salads, and vegetables. 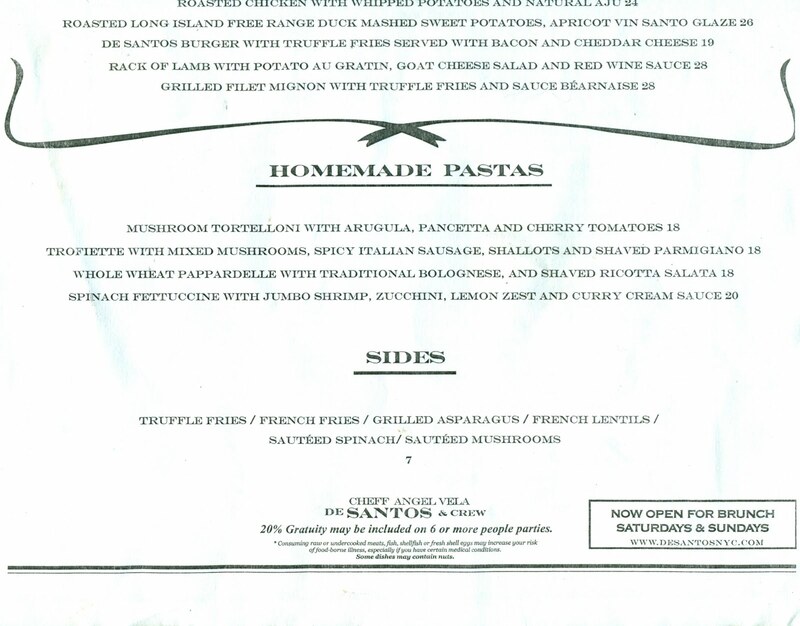 Interestingly, the fixed price depended on what dishes were ordered and when the meal was served. 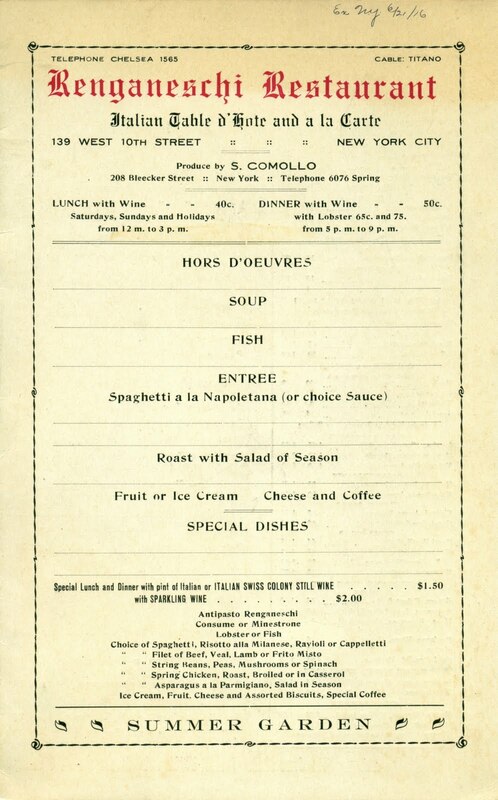 The lowest cost for the five-course "table d’hote dinner" was fifty cents. 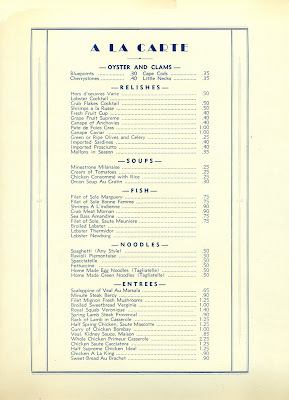 However, this price increased to sixty-five cents if lobster was selected for the third course, and seventy-five cents if the dinner with lobster was served between the hours of 5:00 and 9:00 PM. 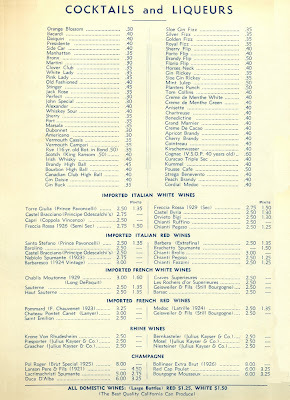 This menu refers to an outside dining area called the “summer garden,” and features an advertisement for the Italian Swiss Colony winery in California, showing the wicker-clad squat bottles once used for the red Chianti wines of Tuscany. 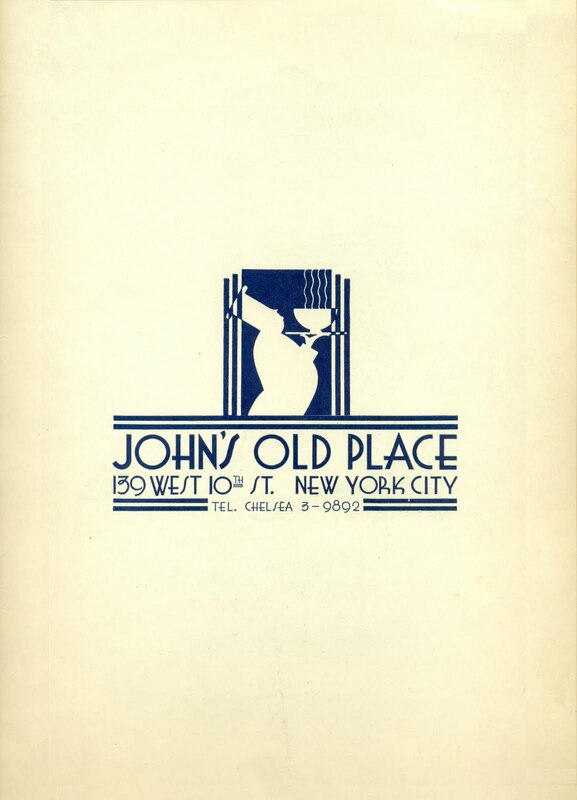 In 1927, Giovanni Renganeschi sold the restaurant to Sicilian-born Giovanni Ballato who renamed John’s Old Place, an anglicized reference to their shared first name. 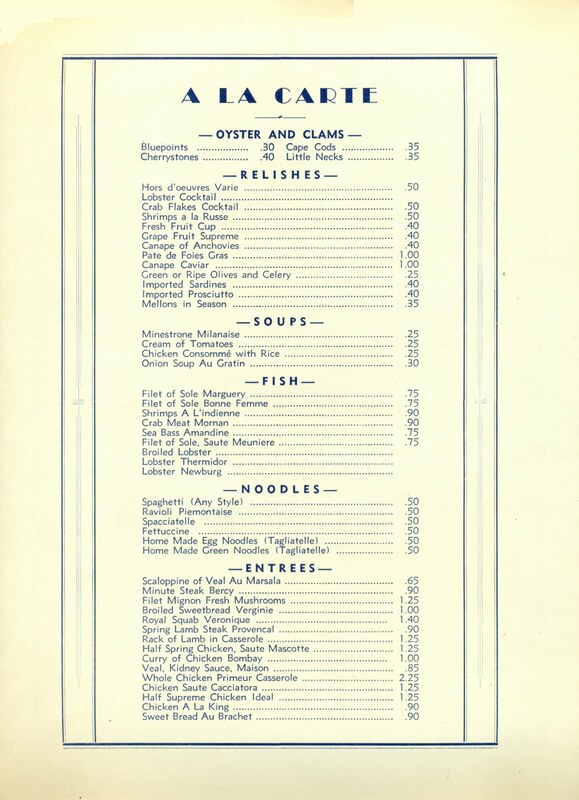 Surprisingly, the menu below from about 1936 employs a number of French culinary terms to describe the Americanized fare. 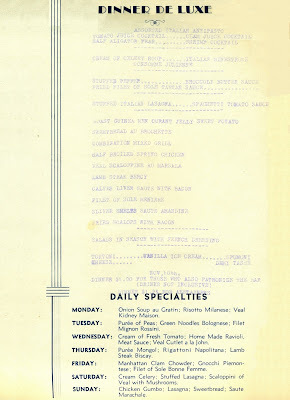 The “Dinner de Luxe” only costs one dollar, reflecting the deflationary impact of the Great Depression. 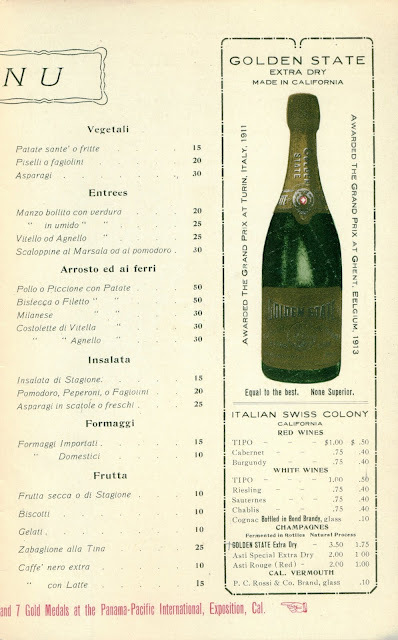 When Ballato sold the restaurant in 1938, he was proud that it had been in continuous operation for forty years, not counting the four months it was closed by the authorities during Prohibition. 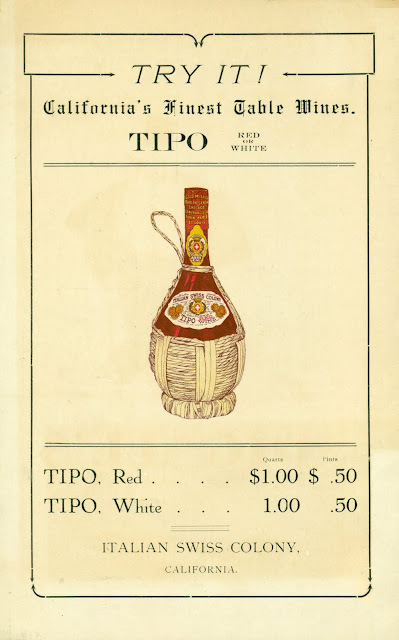 Neither owner appears to have taken the Volstead Act very seriously. The townhouse at 139 West 10th Street dates back to 1845. 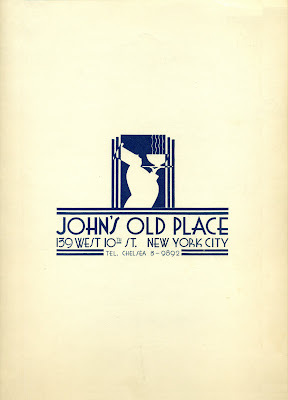 Over the years, it has housed many bars and restaurants, each reflecting another chapter in the history of the Village. In the 1950s, it was called the College of Complexes, an unconventional supper club featuring black décor. During informal lectures and poetry contests, budding writers often jotted down their fleeting thoughts on the walls, or whatever space was available. When it was a beatnik bar and coffee house named the Ninth Circle, playwright Edward Albee saw graffiti in the bathroom that inspired the title of his play Who’s Afraid of Virginia Woolf? Singer Janis Joplin once lived in an apartment on the third floor, and the place was frequented by other music legends like singer-songwriter Bob Dylan, and guitarist Jimi Hendrix who jammed in the basement. The restaurant is now called De Santos. Featuring bare brick walls, the cozy interior has a rustic feeling. The small garden patio at the back is still being used as a dining area. While looking around, I asked the manager what type of food they served. “Italian,” he replied, adding after a moment’s thought, “Well, not really Italian, it’s sort of Italian…it’s based on Italian,” struggling to find the words to describe the cuisine. His answer was close to what the owner of Renganeschi's might have said a hundred years ago. Savvy restaurateurs are still adjusting ethnic cuisines in new ways to attract more customers—the restaurant that preceded De Santos was the Caffè Torino, an “Itasia” that added Asian dishes like spring rolls and beef tataki to its basic Italian menu. 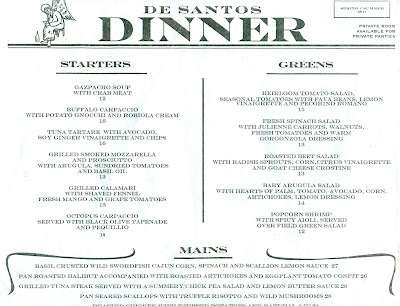 Owner Luis Miguel Amutio created the De Santos concept in Mexico, establishing restaurants in Puerto Vallarta and Guadalajara, before opening this branch in New York in 2008. Shown in two scans due to the large size (11 x 17 in. 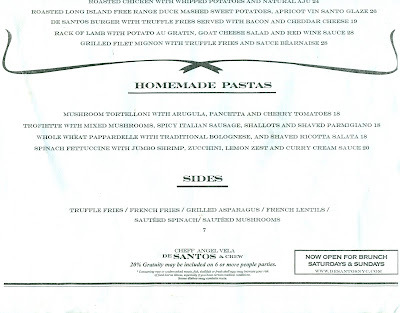 ), the menu below includes Italian-inspired starters like octopus carpaccio, grilled calamari, and smoked mozzarella with prosciutto, along with a selection of homemade pastas. However, the menu includes other types of food, such as the basil crusted swordfish with "cajun corn," and a bacon cheeseburger served with truffle fries. 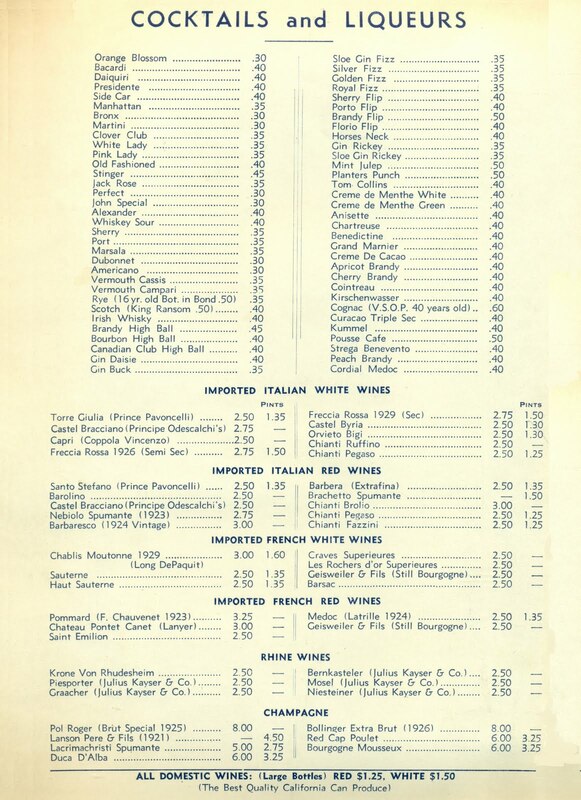 There are also American standards like fillet of beef, rack of lamb, and roast chicken, which are the same type of dishes found on Renganeschi’s set menu. Still, restaurants continue to change with the times. Making a hip fashion statement, De Santos is the first restaurant in New York to equip its staff with Apple iPads, hoping to also improve the efficiency of taking orders. Some believe that such devices will eventually replace paper menus. Perhaps the waiterless restaurant, once the quest of entrepreneurs who developed mechanical equipment like the Automat in the early 1900s, is just around the corner in the Digital Age. 1. Gerald W. McFarland, Inside Greenwich Village: A New York Neighborhood, 1898-1918, University of Massachusetts Press, Amherst, 2001. 2. 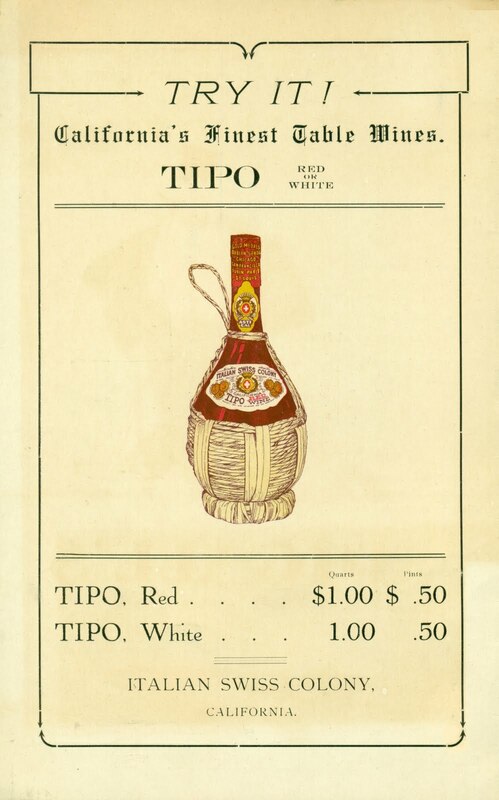 Andrew P. Haley, Turning the Tables: Restaurants and the Rise of the Middle Class, 1880-1920, University of North Carolina Press, Chapel Hill, 2011. This is just the type of blog I like. Very particular in content, very well researched and very readable. I particularly enjoyed the Renganeschi post. My wife and I saw the original in Chicago a few years ago and it evoked then, and still does today, the sense that women were beginning to develop a new kind of social (and political) independence. When I was a sophomore in college (1964-65) my boyfriend worked at the Ninth Circle as a waiter. When he had a weekend day shift I would sit at a back table doing my homework. There were big bowls of peanuts at the bar and on the tables. By the end of the evening the floor would be ankle deep in peanut shells. I was innocent in a way that would be impossible now and was completely oblivious to most of what went on there.